The Storymoja Hay Festival is back. 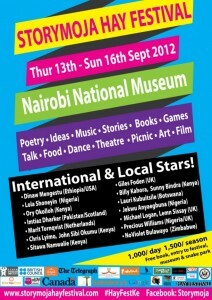 The event is set to hit Nairobi on 13-16th September at the National Museum of Kenya. I first attended the festival in 2009 when it was but a thing at the Impala grounds. During those ages when dinosaurs roamed the earth and the phones of choice were Blackberry (smart) and Nokia (the rest) there were a few dozen tents at the venue. In those days, this blogger was the cutting edge person of all things drinking blogging and new media and I ran session on “Internet Dating” – which as y’all know I am an expert on. Also on the bill was big name Mantalk columnist Oyunga Pala who at the time was running seminars on how “Men Under Attack” and a bunch of other folks. In 2010, the event had moved to the Railways Ground on Ngong Road and here I was also a panellist. In this event, I was running a session on “Facebook hook ups: Is technology changing the fabric of society with the then recently crowned King of Facebook Stephen Syoks Musyoka. It was off the hook that year. Also on the bill were Mantalk columnist Oyunga Pala and relationship columnist Chris Hart running a brunch on “Hooking up with Mr Right”. I really enjoyed this event as I attended every day. Come 2011 and things had changed. Pala and I weren’t running any sessions. We had lost it sadly. Replacing us were the likes of Ben Okri the writer of a book which I only read until page 80 what with its confusing prose. There was also a whole bunch of other people too. So this morning I received word that the Storymoja people that the festival has return I was pretty excited. They are moving on up as the venue moves to the National Museum of Kenya at the Museum Hill which is awesome as there will be no more going to the bar on the day looking dusty. The people lined up are pretty cool. “Lawyer, activist Miguna Miguna talks about his provocative and controversial memoir Peeling back the Mask“ This is copied verbatim from the press release so Destroyer and his cronies can finally unleash whatever was on the catapult on Miguna as they take of with yet another cap. The new name in all things tech nowadays is Google’s top honcho and Ushahidi Founder Ory Okolloh and she will be talking about “freedom of expression.” And then there is a mix of the usual suspects and new kids on the block like Billy Kahora (Kenyan shortlisted for Caine 2012 and editor of Kwani? ), Zimbabwean NoViolet Bulawayo (winner of Caine 2011), Nigerian Jekwu Anyaegbuna (winner of 2012 Africa Commonwealth Writers Prize), Botswana Lauri Kubuitsile (shortlisted for Caine 2011) and Kenyan Claudette Odour. With such a sterling cast and many more you really want to attend this years gig.